Choose your color and your ready to go. Shipping usually takes around 3-7 business days. 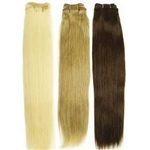 Our track hair extensions are 100% human hair. The hair is attached to a single weft. 100 grams.